The Butte Humane Society Veterinary Clinic is providing continued relief for Camp Fire impacted pets! 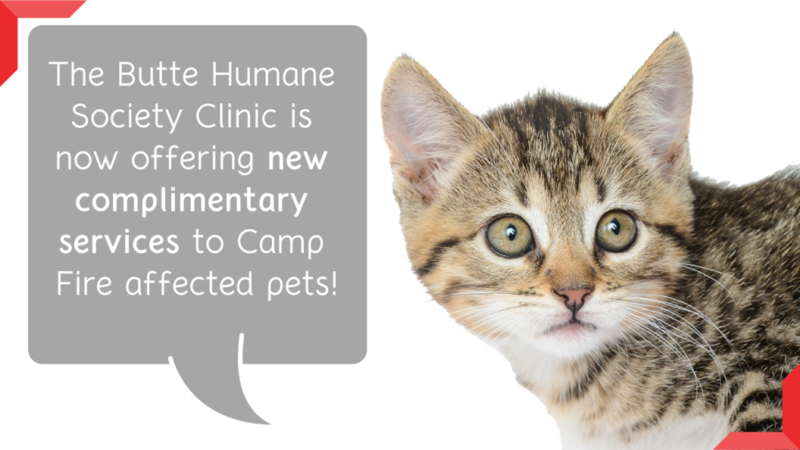 In addition to the fee-waived microchips and core vaccines we have been providing since November 2018, we will also be offering fee-waived veterinary exams, heartworm testing, feline viral testing, and spay/neuter vouchers through April 30th, 2019. We know the need for assistance isn’t over, and we want to help the best way we know how – by taking care of your furry family members! We are so appreciative of the support we have received from those both in and outside of Butte County whose donations have allowed us to continue offering these services. If you or someone you know has been impacted by the Camp Fire and is in need of veterinary services, please call us for an appointment today! 530.343.7917 x 202.